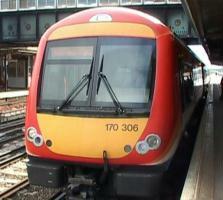 A return cab ride journey aboard a Class 170 “Turbostar” 2-Car Unit of South West Trains from Romsey to Totton via Chandlers Ford, St.Denys & Redbridge. Chandlers Ford, Eastleigh, Southampton Airport Parkway, Swaythling, St.Denys, Southampton Central, Millbrook & Redbridge terminating at Totton. We then travel to Totton Yard Sidings before returning to Romsey.